Kick off your visit on the 9th (Wed): contemplate the waterfront views at Jordan Pond Nature Trail and then take your sightseeing to a higher altitude at Cadillac Mountain. Get ready for a full day of sightseeing on the 10th (Thu): hike along Heart of Acadia Loop, stop by Quietside Cafe & Ice Cream Shop, and then hike along Flying Mountain Hiking Trail. To see maps, other places to visit, ratings, and other tourist information, use the Acadia National Park vacation builder. Durham to Acadia National Park is an approximately 6-hour flight. You can also drive; or do a combination of train and bus. Prepare for little chillier weather when traveling from Durham in August: high temperatures in Acadia National Park hover around 75°F and lows are around 58°F. Cap off your sightseeing on the 11th (Fri) early enough to go by car to Bar Harbor. Bar Harbor is a town on Mount Desert Island in Hancock County, Maine, United States. Step out of the city life by going to Kayaking & Canoeing and Mount Desert Island. Get a sense of the local culture at Bass Harbor Head Lighthouse and Egg Rock Light. Change things up with a short trip to Ship Harbor Nature Trail in Bass Harbor (about 30 minutes away). The adventure continues: trek along Ocean Path, pause for some serene contemplation at St Saviour's Episcopal Church, look for all kinds of wild species at Shore Path, and see the interesting displays at The Seal Cove Auto Museum. For reviews, traveler tips, ratings, and tourist information, refer to the Bar Harbor trip builder. Bar Harbor is just a stone's throw from Acadia National Park. In August, daily temperatures in Bar Harbor can reach 75°F, while at night they dip to 58°F. Finish up your sightseeing early on the 14th (Mon) so you can go by car to Camden. Camden is a town in Knox County, Maine, United States. Start off your visit on the 14th (Mon): immerse yourself in nature at Camden Hills State Park and then take in the awesome beauty at Mount Battie. On the 15th (Tue), you'll have a packed day of sightseeing: contemplate the long history of High Street Historic District, then explore the activities along Megunticook Lake, and then steep yourself in history at Farnsworth Art Museum. To find ratings, where to stay, photos, and more tourist information, read our Camden itinerary builder. You can drive from Bar Harbor to Camden in 2 hours. Alternatively, you can take a bus. Expect a daytime high around 73°F in August, and nighttime lows around 57°F. Finish your sightseeing early on the 16th (Wed) so you can drive to Portland. Start off your visit on the 16th (Wed): see the interesting displays at Portland Head Light, then hike along Back Cove Trail, and then revel in the low prices at L.L. Bean Factory Store. Keep things going the next day: appreciate the extensive heritage of Old Port, visit a coastal fixture at Portland Breakwater Lighthouse, and then immerse yourself in nature at Mackworth Island. To find other places to visit, ratings, and more tourist information, go to the Portland tour planner. Traveling by car from Camden to Portland takes 2 hours. Alternatively, you can take a bus. August in Portland sees daily highs of 78°F and lows of 59°F at night. Wrap up your sightseeing on the 18th (Fri) to allow time to drive to Ogunquit. Your itinerary includes some good beach time at Footbridge Beach and Long Sands Beach. Give yourself a bit of retail therapy at Faneuil Hall Marketplace and Kittery Trading Post. Venture out of the city with trips to Boston (Granary Burying Ground & Freedom Trail) and Strawbery Banke Museum (in Portsmouth). 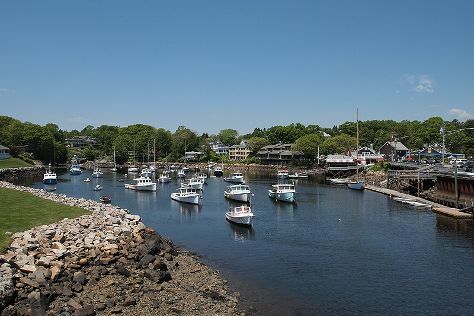 There's lots more to do: tour the pleasant surroundings at Wells Beach, kick back and relax at Ogunquit Beach District, and appreciate the extensive heritage of Marginal Way Walkway. To find other places to visit, where to stay, reviews, and other tourist information, read Ogunquit itinerary maker. Drive from Portland to Ogunquit in an hour. Alternatively, you can do a combination of train and taxi. In August, daily temperatures in Ogunquit can reach 79°F, while at night they dip to 56°F. Finish up your sightseeing early on the 21st (Mon) so you can go by car to Kennebunkport. Kennebunkport is a town in York County, Maine, United States. Keep things going the next day: enjoy the sand and surf at Rachel Carson National Wildlife Refuge, then enjoy the sand and surf at Parson's Beach, and then take in the architecture and atmosphere at St. Ann's Episcopal Church. To find reviews, traveler tips, maps, and tourist information, read Kennebunkport holiday planner. Kennebunkport is very close to Ogunquit. In August, plan for daily highs up to 80°F, and evening lows to 56°F. Wrap up your sightseeing by early afternoon on the 24th (Thu) to allow enough time to travel back home.